Topic: A Neuroscientist Explores the "Sanskrit Effect"
I spent many years studying and translating Sanskrit, and became fascinated by its apparent impact on mind and memory. In India's ancient learning methods textual memorization is standard: traditional scholars, or pandits, master many different types of Sanskrit poetry and prose texts; and the tradition holds that exactly memorizing and reciting the ancient words and phrases, known as mantras, enhances both memory and thinking. Re: A Neuroscientist Explores the "Sanskrit Effect"
Yeah...not gonna offer up cants to Yama or any other moon-god! If it is memorization and repetition that works...I suggest The Bible, biographies on the Founders and other histories on early colonists and such, things like that. That goes along with the observation that learning a new language and/or musical instrument can put off Alzheimer's. You get the mind concentrating time and again. In essence, mental aerobics. Concentrating on an idealized spiritual may throw in some extra positive feelings to reinforce it. There can be problems when you get hung up on a mantra - like overworking and/or stretching a muscle too much. One goal of improving the intellect is a better life, but if the brain gets hooked on the ecstatic point the rest of the mind gets drawn in there at the expense of other aspects. In short - when taken too far this whole mantra stuff can backfire. Don't ask me how I know. At that point you can call it worshiping a false god. Trouble ensues. I don't believe eastern mysticism concerns itself with a particular moon god. That's the domain of Islam. I'm guessing the same holds true for the Psalms & Proverbs of the Bible . . .toss in some Hebrew & Greek words, like koi·no·ni·a, & you'll boost yourself light years ahead..! Hinduism is replete with moon-gods galore, they are entirely polytheistic...they claim millions of gods. The Vedic texts are a wild read. Buddhist's and their 4 truths can appear to some as being un-human...and their sects range from atheistic to theistic and pantheistic...which enters into moon-gods. Nirvana just wasn't a band from Seattle...its an ethereal undefined you'll know it when you see it end point, not the defined Heaven of our Judeo-Christian heritage. They don't believe in sin...they call it ignorance, evil and good are amoral. Sihks are a blend of Hindu and Islam...enough said. Jainism follows the 24th Jinas (god) called Lord Mahavir but they idolize all 24 Tirthankaras, just one trumps the rest. A scaled-down version of Buddhism. Moon-gods? Check. Taoism - There is religious Taoism that is pantheistic and has some nature and ancestral worship to it, and the more common non-religious Taoism of Lao Tzu that is more a moral teaching that leaves a persons central religious belief up to them. Shintoism is pantheistic, replete with numerous gods and spirits, is animistic and in-animistic (see idol worship) and believes in spirit possession like shamanism. It literally translates as "the way of many gods", so moon gods? Check. Confucianism was founded by its namesake of course, and it is a harder nut to crack open and explain. It originated as a political, social, moral, ethical and loosely religious belief system taught to the wealthy and powerful in the Zhou Dynasty. Religiously there is some ancestor reverence, but not worship. There are religious ceremonies like funerals, but no deity...just a general and vague anthropomorphic to whom it may concern. It is generally agreed that Confucianism is a largely non-religious practice that leaves the practitioner to incorporate their beliefs within Confucian concepts, which for Chinese has been mostly Buddhism and Taoism. They have 5 classics (I Ching: yin/yang probably best known) and 4 books. The Chi-Coms naturally crack down on all religions...they see any moral and ethical system as a direct threat to their godless ways. Islam, no comment needed beyond they are the worst of all hands down no question about it. So, outside of non-religious Taoism and Confucianism (if an authentic Christian belief is your center) the others are moon-god in nature IMHO and should be discouraged and avoided. I recall that there are countless Hindu gods - likely even a god of teapots. Now that you mention it, I'd be surprised if there weren't a moon god. But when I think of Hindu I think of the 3 biggies: Krishna, Vishnu and Shiva. I don't believe they're moon gods. 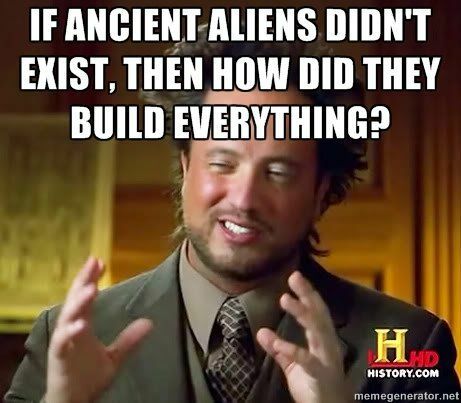 ...think those Hindu gods were really...aliens! Moon God = Made up sh*t!